Last weekend was our 11th wedding anniversary as well as my 39th birthday. One big ball of milestones headed directly towards me. The end of an era. My 30s to be exact while also the celebration of a wonderful partnership with my husband. The plan was to head downtown. Stay overnight at a hotel and get something to eat. Everything was going great and then came dinner. Have you ever eaten snow crabs? Well I have, but sometimes I have selective memory. I forgot how hard it is to eat them. First off, I could not crack the crab. So instead, I pulled each leg off causing juice to fly all over me. Keep in mind that I have problems with fine motor skills. It’s hard for me to button my shirts and hold things. 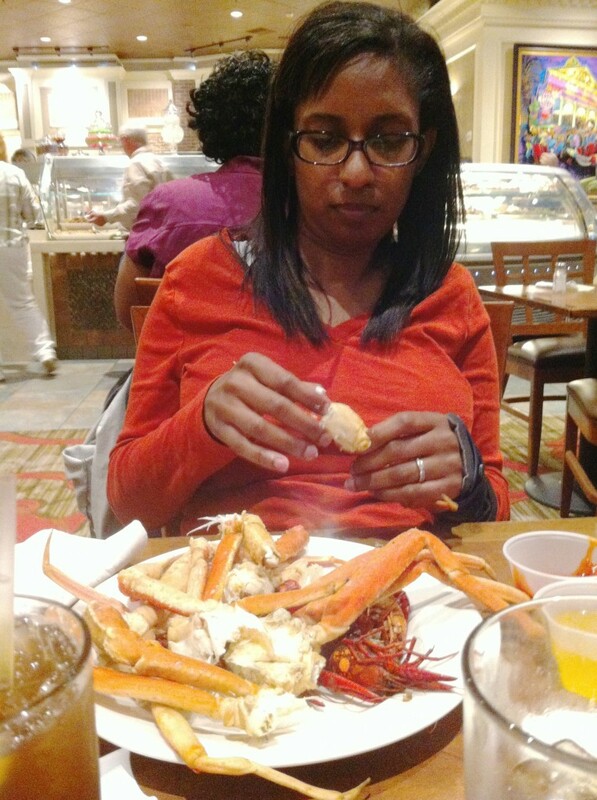 But for some reason I thought I could conquer these crabs. After I failed at my attempt to eat the crabs, I saw that my table was a mess and I was covered from head to toe with crabmeat. But I was still determined to have a nice dinner. Thank goodness we were at a buffet, so I did have other choices of food. To help out our waitress, I cleaned my immediate surroundings then I politely picked up another plate and started over with a different entrée. So the dinner was not a total loss. FYI, I did leave a nice tip. I just had the same experience two nights ago with Maryland steamed crabs. It looked like a crime scene after I ate them, and I’m talking about my shirt! At least you can clean your mess!!! My mom or sisters or kids clean mine!! I love all seafood and don’t know what I would do if I couldn’t eat it!! Happy birthday to you! Happy Anniversary to y’all!! Happy Birthday AND Anniversary! Thanks for sharing. Marie E., thanks for reading! That is one scary crab ! I look forward to your posts as they are quite engaging and honest! I have found that if someone is staring that I put the menu up to obstruct their view ! Happy birthday and anniversary! Crab is my greatest regret. 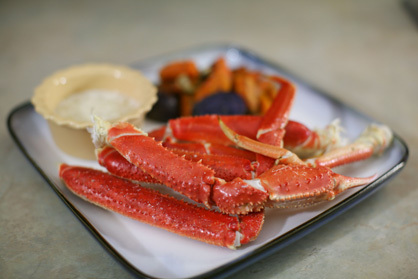 I absolutely love Dungeness crab and morn the loss of being able to handle crab in the shell. It’s nearly impossible to find it in a restaurant in recipes that’s not in the shell. More power to for trying to tackle it. I know I couldn’t do it. I’m still looking. I have almost no use of my left hand making two-handed operations nearly impossible. Sandy, thanks. well I sure did try! Hi Nicole yes I have tried snow crab. Try being the key word. My husband and I along with another couple went out for dinner one night and my girlfriend asked if I wanted to get a side of crab legs with her I agreed. You should have seen us trying to crack them open as there was sooo much butter we could not even keep them in our grips. We looked like something from an I Love Lucy show. (Lucy and Ethel). Embarrasing then, funny now! Sorry for your mishap. Don’t give up. Happy Birthday as well as Happy Anniversary. I’m glad you were able to get out and about. Take care. Pam, thanks and I wish you all the best! Nicole–You did just fine!!! Belated Happy Birthday to you!!! Michael, thanks it was a good day! I want to wish you a very happy birthday, and say congratulations on your anniversary! How sweet that your hubby took you out to celebrate. Many more years of life to you, and many years of a happy partnership. Laurie, thanks for the well wishes. Take it from a Maryland girl, if you DON’T make a mess eating crabs (any kind) you’re not doing it right! Happy birthday and anniversary! Jennifer, I used to live in Silver Spring. We should chat sometime. Thank you. Happy Birthday! Happy Anniversary! I’m the same way with my hands — I can make such a mess. Usually, if we’re out, and I’ve ordered something difficult to handle, my husband will discreetly cut/dismantle/reorganize my plate. I prefer staying at home, where I can eat without anyone looking. Glad you enjoyed your special days. Linda, thank you. that’s good to know! I don’t think anyone can eat snow crabs gracefully. I am glad that you tried and that you had other food options after that. Happy Birthday and Happy Anniversary! Sue, You right! who eats crabs gracefully anyway! Amy, I’m glad you got a tickle! LOL Nicole – I have had crab legs, but I have never in my life had the ability to get the meat out. My husband gets it for me. I am glad you had a nice evening anyway. Happy Birthday! and congrats on your anniversary! Laurie, next time I will put my husband to work!